The 621 Gallery will be hosting two exhibitions in the month of April: Bucky McMahon: Paintings, Sculptures, Dream Toons, and Borrowed Bodies: A retrospective by Linda Hall. In the Nan Boyton Gallery, Bucky McMahon: Paintings, Sculptures, and Dream Toons will be on exhibit April 3, 6-9pm. Art Happ Hour is on April 23, 5-7pm. Bucky McMahon and Gary White will be talking about their art, and reading from their writings on April 3, 6-7pm. 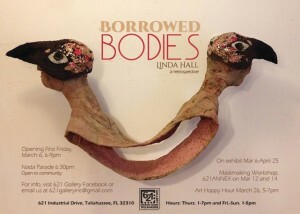 Borrowed Bodies: A Retrospective, by Linda Hall, will be on exhibit until April 25th.